Replogle's Weather Watch Desk Globe appeals to the aspiring scientist in us all. 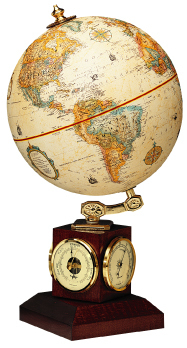 The wood base includes a thermometer, barometer and hygrometer, each with beautiful old world details. This 9" globe is meridian-free, giving you an unobstructed view of our world. It's mounted with polished brass hardware and topped with a eye-catching finial. Colorful land masses and antiqued oceans give the Weather Watch a classic appearance. Backed by a one-year warranty.